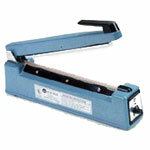 This line of Adjustable Angle Impulse Foot Sealers is perfect for sealing liquids, powders or any loose items. 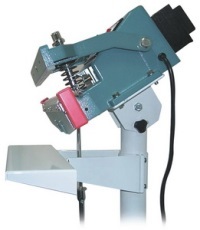 The Adjustable Angle Impulse Foot Sealer comes standard with the adjustable head angle that will allow the user to bring the sealing jaws closer to the product. The adjustable head on this Impulse Foot Sealer is adjustable up to a 45-degree downward tilt that will decrease the need to regularly lift the product to the sealing jaws, thus maximizing production time and downsizing user fatigue. 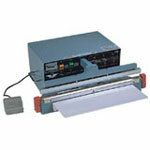 An extended foot pedal and large heavy duty work table are included with this Adjustable Angle Impulse Foot Sealer. 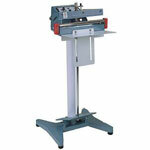 The Heavy Duty Work Table is adjustable and can support up to 45 pound items with ease. 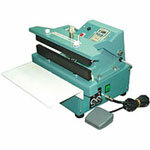 Order your Adjustable Angle Impulse Foot Sealer at Boatman Marking today.